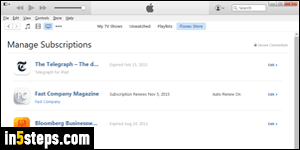 It's very easy to subscribe to magazines and various daily newspapers from iTunes, your iPhone / iPod touch, or your iPad. Canceling these subscriptions isn't that obvious, however: in this tutorial, I'll show you how to prevent a subscription from automatically renewing, and how to do it from iTunes, or from one of your iOS devices. Normally, you should receive an email from Apple informing you that a subscription is about to renew (see screenshot). If you read such an email from an authorized Mac or Windows PC, click on the account settings link in the message: it will automatically open the right screen in iTunes. Either way, here's how you view and optionally cancel subscriptions: from iTunes' main window, click on the Store menu and pick "View Account". 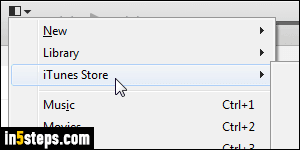 If you didn't restore iTunes' classic menus on Windows, click on the button in the top left corner and go to iTunes Store > View Account (screenshot). Make sure that the correct Apple ID is showing (email address), and enter your password. When your account page opens, scroll down to the very bottom, and click on the Manage link on the right of "Subscriptions". Note that the number of displayed includes current and past subscriptions - don't get scared! The next screen shows the name of each magazine or newspaper you've ever subscribed to: inactive subscriptions show the words "Expired", followed by the date on which the subscription stopped. All active subscriptions show "Subscription Renews", followed by an end date; their "Auto-Renew" setting is set to On by default. Click on the Edit link next to the publication name. You can generally switch from a yearly to a monthly subscription (more expensive, but with lower upfront costs). 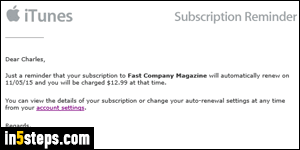 To cancel your subscription, select Off next to Automatic Renewal, and click on the Done button at the bottom. When the "Are you sure you want to turn off auto-renewal" confirmation opens, click Turn Off. Do all this before your subscription expires, or you won't be able to retro-cancel or get credit for it for that purchase without contacting Apple! Bonus Tip: you also cancel subscriptions from your iPhone / iPad / iPod touch. Tap on the iTunes Store app, scroll down to the very bottom and tap on your Apple ID (email address). 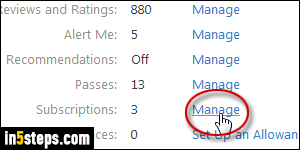 Enter your password, and tap on the Manage link shown below Subscriptions. Tap on the active subscription you want to stop, and tap on the toggle switch next to Automatic Renewal. Confirm that you want to "Turn Off", and tap Done in the upper right corner of the screen.